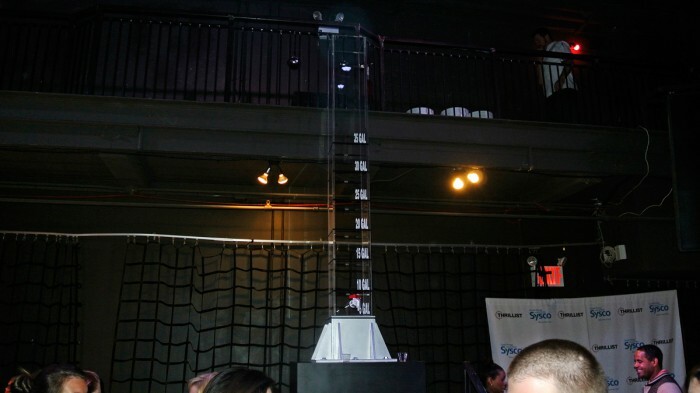 This year I had the pleasure of experiencing two of the many events being held for New York City Wine & Food Festival. This is a massive three-day festival with with well over 50 different events taking place in a variety of locations around the city. Over the weekend, my girlfriend Amy and I attended two of the events, first on Friday night up near Columbus Circle for Thrillist’s Barbecue & The Blues hosted by Robert Irvine followed by Sunday in Astoria, Queens for Oktoberfest presented by Pat LaFrieda Meats and hosted by Andrew Zimmern. To say I was excited about attending each of these events would be an understatement. 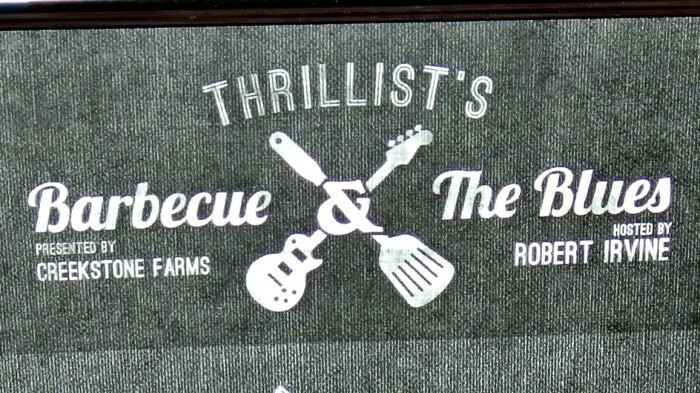 Let’s begin with the Thrillist Barbecue event. For starters, I’d say that entering the event was a kind of strange process. 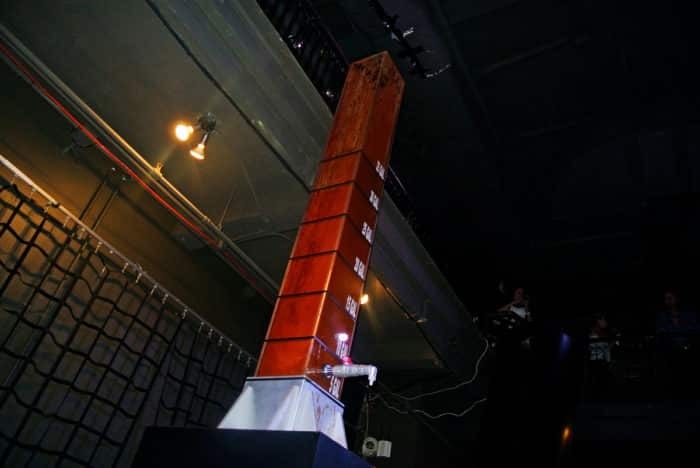 The venue is an underground nightclub called Good Units located in the basement of the fancy Hudson Hotel. The line snaked its way through the underbelly of the hotel through back-hallways and stairwells which I imagine are not usually accessible by visitors. I definitely felt a little weird waiting in this sterile hallway while reading the hotel’s silly motivational acronyms and posted list of “hotel creepers” to beware of. 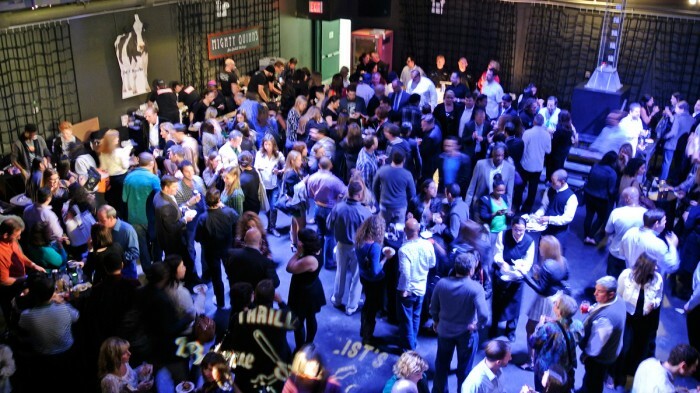 Once we finally enter the space we’re confronted with tons of well-dressed people swarming the different food tables. Throughout the night I sample nearly every table, though there are some I did not get to, because it’s honestly a ton of food. Even more than my belly’s limits. 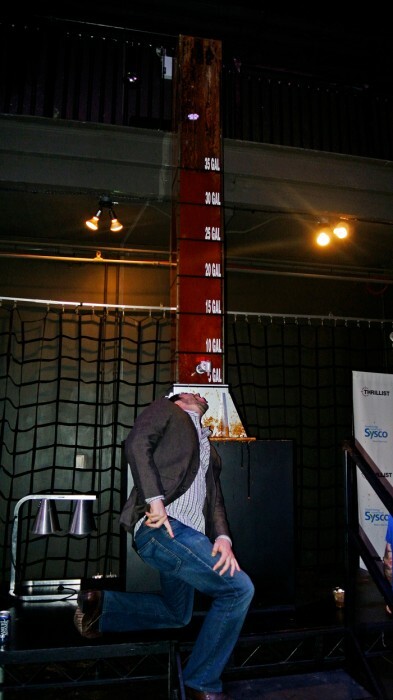 There were also a number of alcohol sponsors for the event including Sam Adams beer, Gnarly Head wine, and Larceny bourbon which I generously partook in as well. 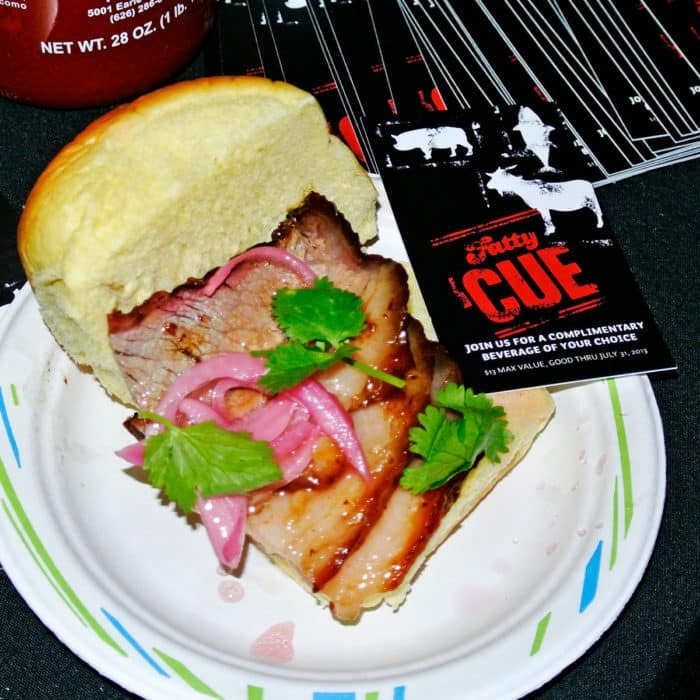 The first table we came across is Fatty ‘Cue, which for those of you who frequent my site know, I love very much from my previous visit. 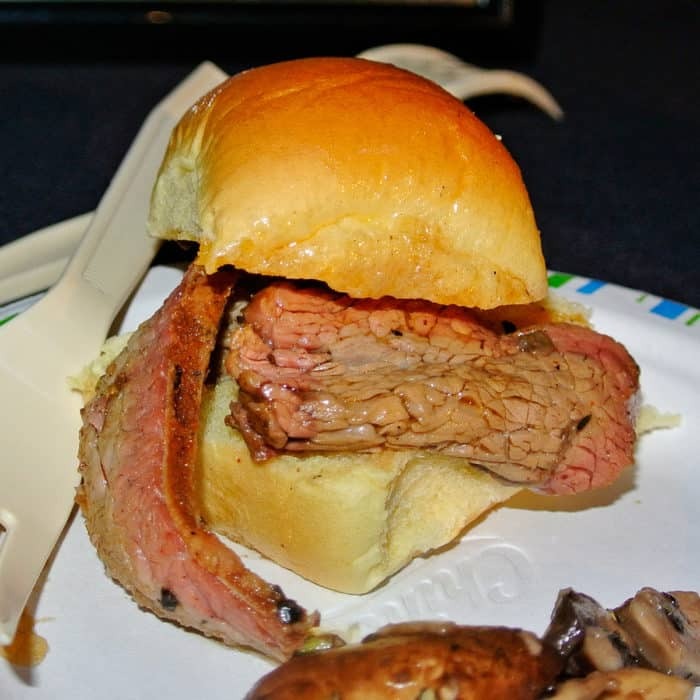 Today, they are serving a dish called Smoked Beef Brisket Sliders. All I’ve got to say here is wow! The meat is tender, sweet, sticky, and flavorful with a touch of smoke. The pickled onions contrast the sweet and meaty brisket just right making this quite a nice couple of bites. 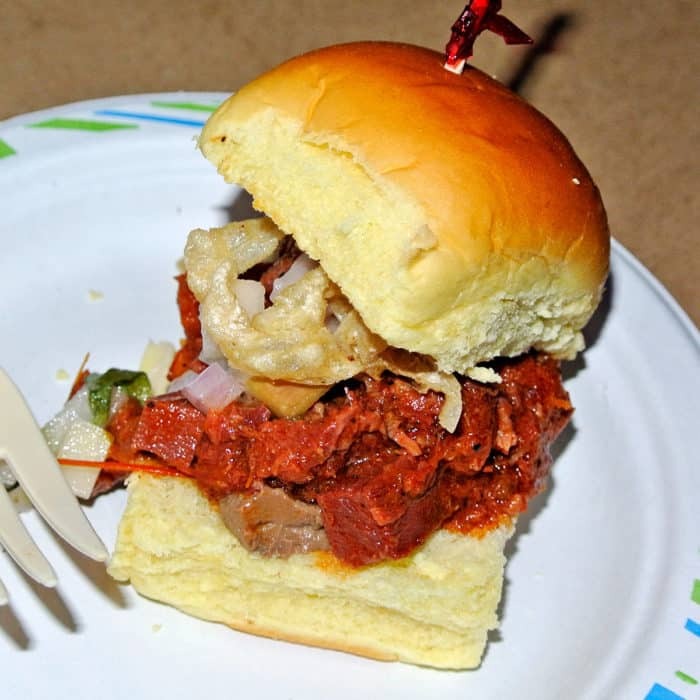 Next we hit up the Duck’s Eatery table which is serving up two items: Offal Sloppy Joe’s and their famous Dee’s Nuts. I personally am not remotely scared of eating offal aka organ meat, but I know many people have a hard time with it. Honestly, if I wasn’t told what I was eating, I would not have known it was organ meat. 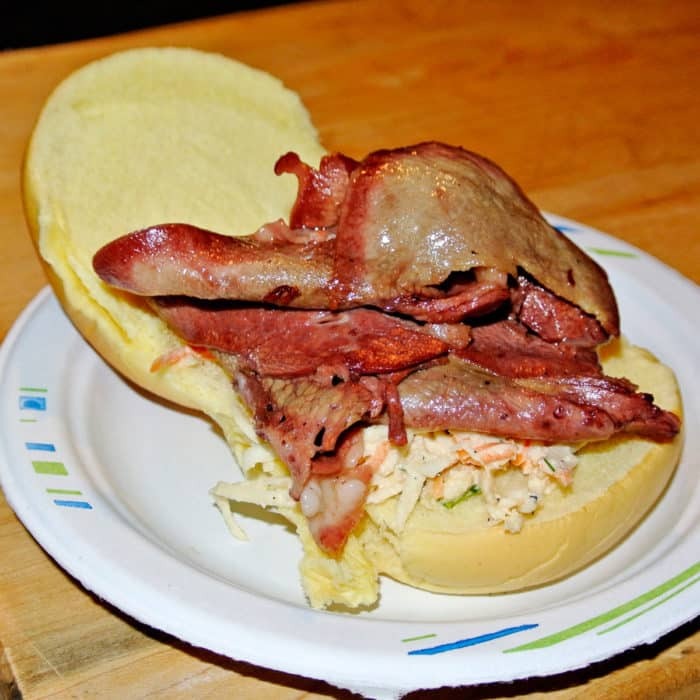 This dish is described as pickled and smoked beef innards, fried tripe, and fermented apples on a potato bun. I think it’s quite a nice, flavorful, unique dish that there’s honestly nothing to be scared about. Accompanying the offal sloppy joe is a dish I have enjoyed once before at their brick-and-mortar location, called Dee’s Nuts. I’m kind of obsessed with them. It sounds so simple, just cocktail nuts. But the way these come together texturally and flavorwise is really remarkable. 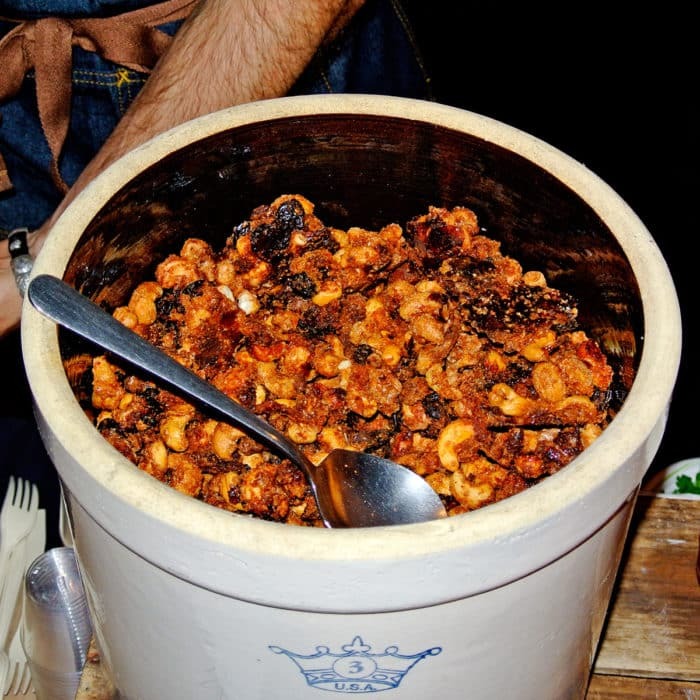 They combine roasted cashews with crispy and smokey Benton’s bacon, sour cherries, chili, lime, and cocoa crispies for an ultimately very addictive bar snack. Next up is the Tchoup Shop table. They are a New Orleans influenced eatery so I was very happy to find they were offering some of my favorite items from last year’s trip to to New Orleans like boudin balls. 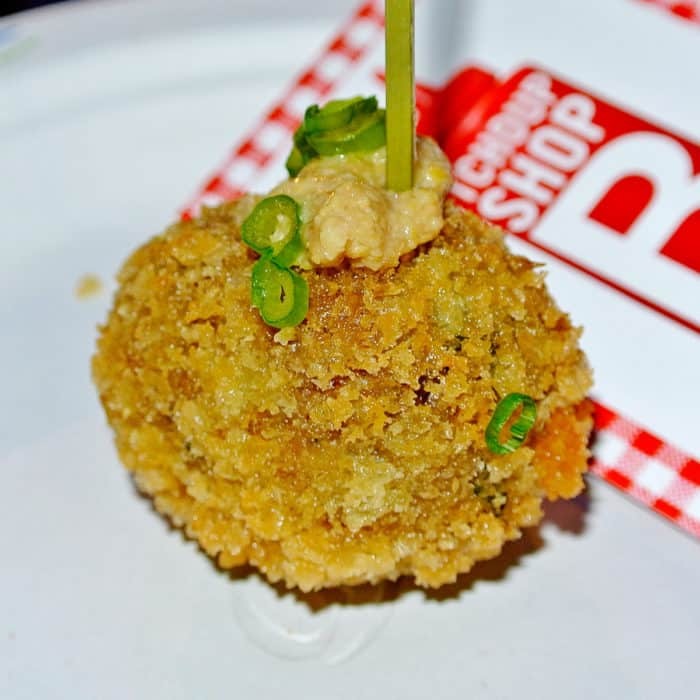 Tchoup Shop’s version is called Beef Brisket & Duck Liver Boudin Balls. If you think there’s any chance I didn’t love these, then you don’t know me. 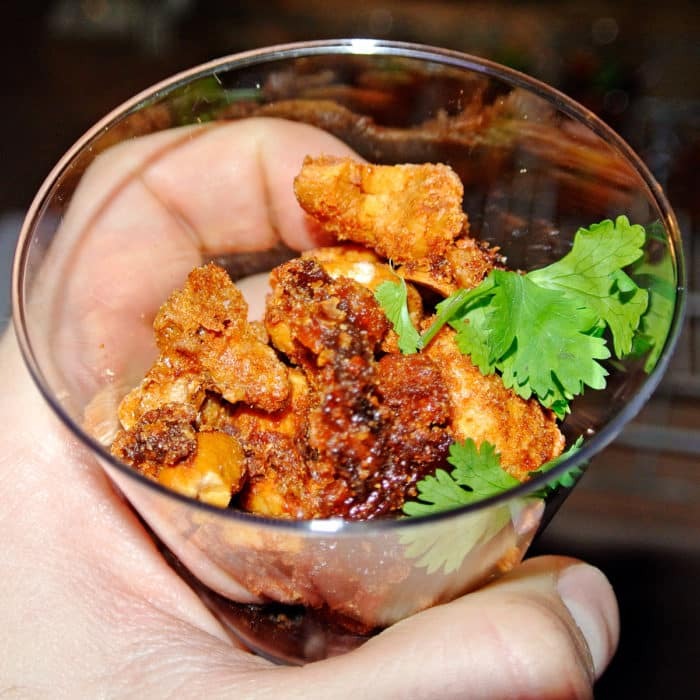 They’re hot, crispy, and bursting with unctuous meaty flavor. The dab of creole mustard pairs perfectly too. 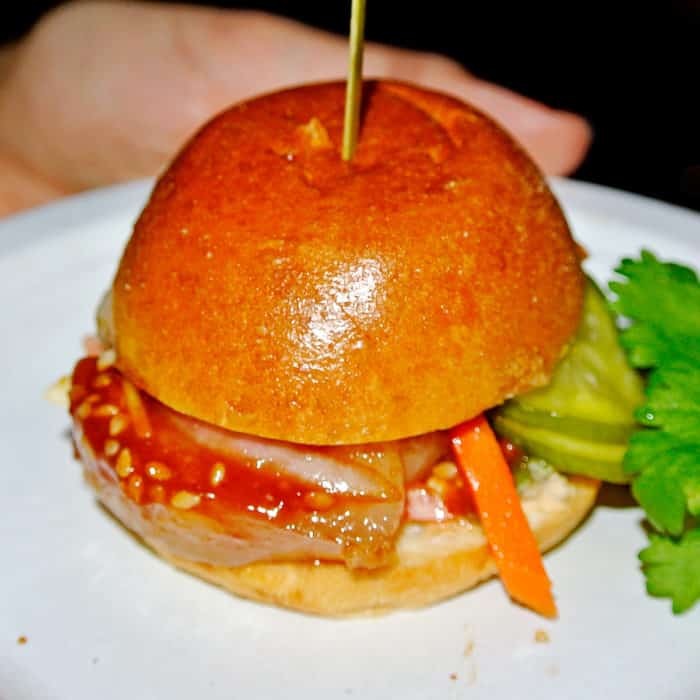 Tchoup Shop is also serving a dish they call BBQ Pork Belly & Spicy Jumbo Lump Crab Sliders. 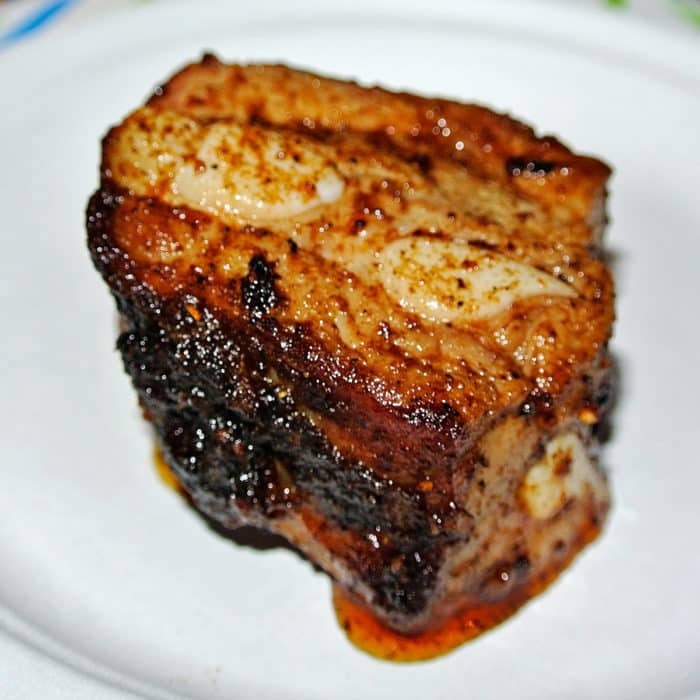 Combining seafood and pork belly? Are you kidding me? Just great. You get the bright, oceany saltiness of the crab meat which mixes so well with the bold, juicy pork fat. At this point we realize that there is an upstairs area with five more tables that most people haven’t realized exist yet. We b-line up there and find ourselves with much more space and no lines. Our first stop is at the Jeepney Table for a plate of their Adobo Marinated Beef BBQ. 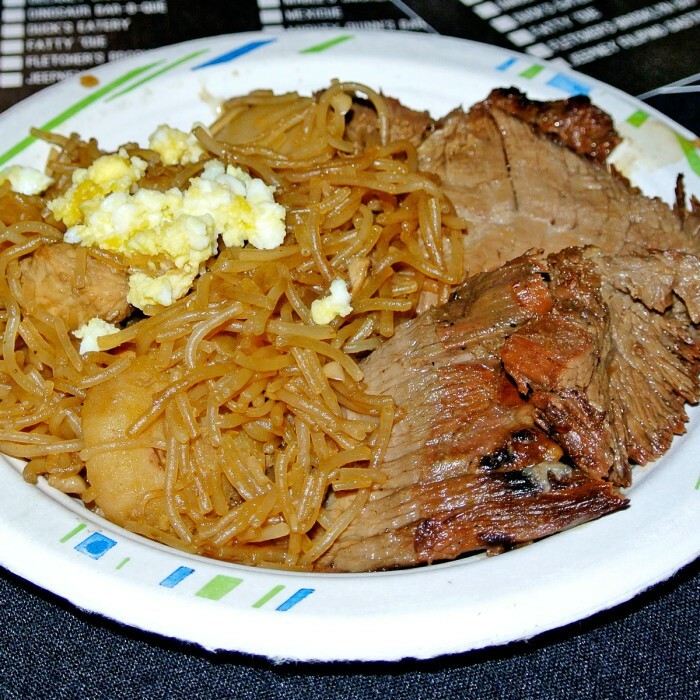 Jeepney is a Filipino eatery so their platter is unsurprisingly served with a side of Pancit Bihon noodles. The brisket is quite tender and has nice Asian flavors from the garlic, soy, and coconut vinegar marinade but this plate probably wouldn’t be one of my top picks for the night. Across the room, we then hit the Raymi table for their Smoked Adobo Pork Ribs. I honed in on the meatiest riblet I could find. While I enjoyed the flavor of the rub on the ribs, the meat was not as tender and melty as I’d like and there was a lot of bone and cartilage to contend with. 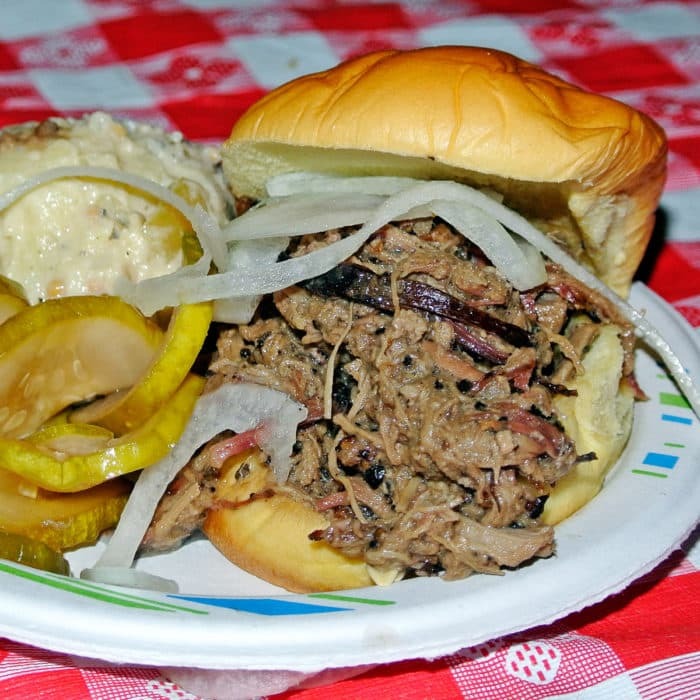 Next up is Daniel Delaney’s famed Delaney BBQ. This is my second opportunity to sample his beloved brisket, which on my previous attempt I found to be just fine for New York standards, but definitely not worthy of all of the crazy fanaticism. Once again I find myself perplexed. The texture and moisture in the brisket is really impressive. It’s incredibly juicy, but there’s just no flavor. No spice. Nothing. I think he’s got the cooking technique nailed, but is completely missing the mark in regards to flavoring and spicing the meat. It pales in comparison to the real deal stuff in Texas. On the other hand, I think the accompanying potato salad in mustard vinaigrette is probably the best potato salad I’ve ever had. I love the mustardy, vinegary bite. 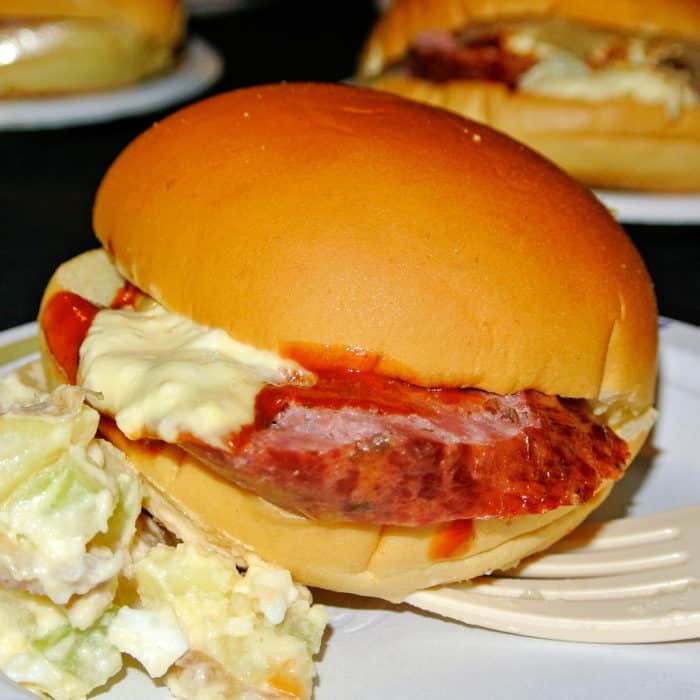 Next, we head to the Mable’s Smokehouse table where they are serving a very intriguing item. They call it a “Smo-Cone”. 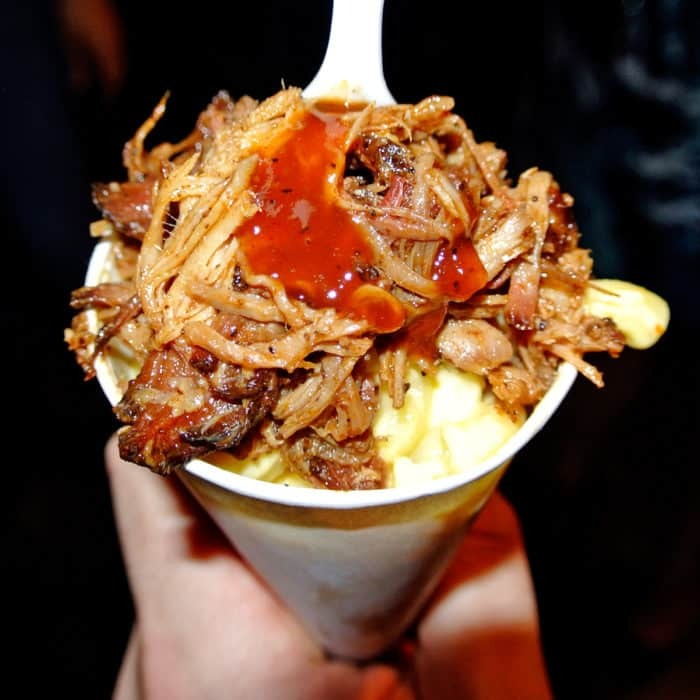 They take a paper sno-cone container and load it up with pulled pork, mac-n-cheese, pickles, and barbecue sauce. Go on and tell me that’s not making you drool. I don’t believe it. This is certainly one of the top dishes from the night. 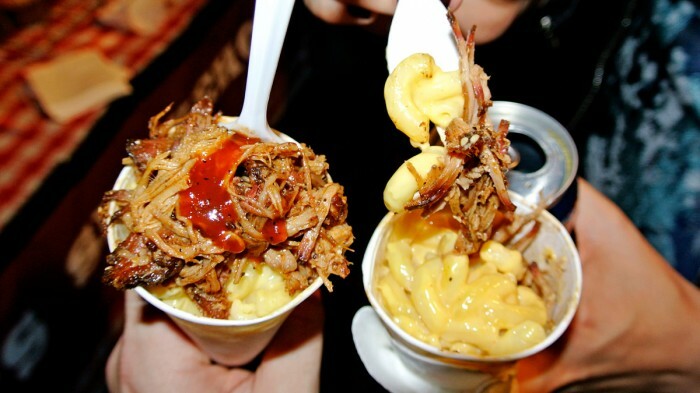 The meat is very tender, well shredded, and the mac and cheese mixes well with each meaty bite. But, really, I think it’s the barbecue sauce itself that really makes the dish. It’s a very bold sauce that ties all of the elements together really well. The next stop is at the Mile End table where they’re serving BBQ Beef Tongue Sandwiches. I personally love a good tongue sandwich, but unfortunately this one really didn’t do much for me. I thought the cold meat was a strange decision and it was a bit drier and tougher than I would have liked. At this point we take a breather and check out the view of the room from the upstairs balcony before heading back into the mess downstairs to taste more of the tables we passed over at the beginning in our attempt to avoid lines. 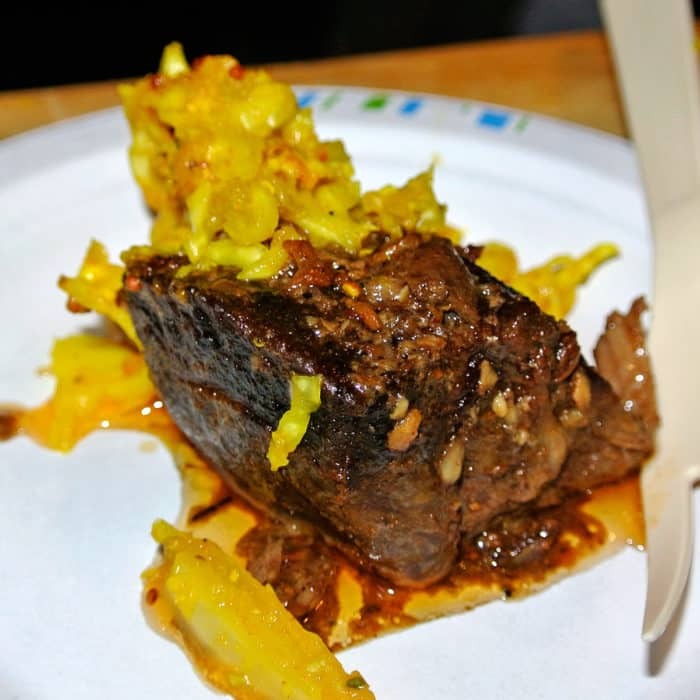 After returning downstairs, we head over to the Joe & MissesDoe table where they are serving beautiful looking Smokey-Garlic Beef Ribs. They are very garlicky indeed. A quick sniff of the dish fills my nostrils with the pungent sting of garlic. As I push my fork into the beef I find myself surprised by the firmness. After breaking through the exterior I find nice, tender meat inside, but the crust is a little off-putting for a beef rib. The flavor is actually quite milder than I would have expected based on strong scent as well. Get ready for it. THIS IS IT. I’ve found it. 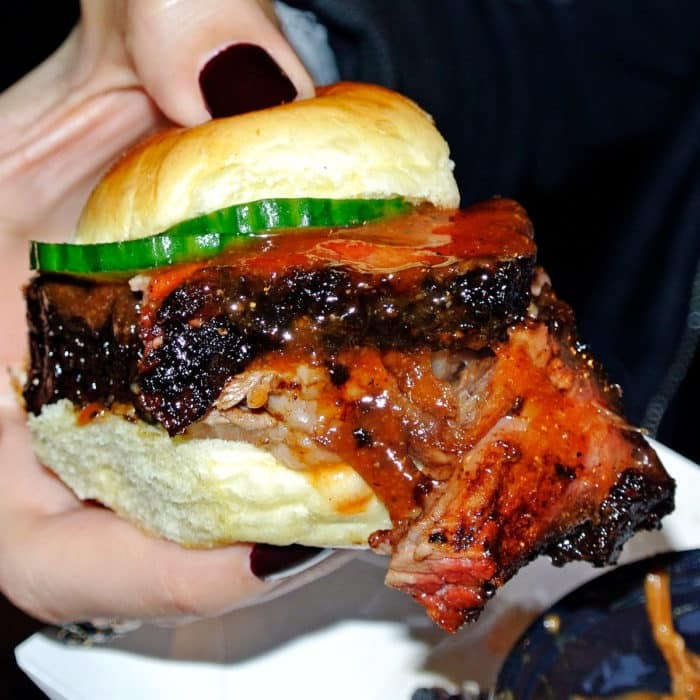 At the Mighty Quinn’s table I found absolute perfection and authenticity in regards to Texas style brisket. This is just as great as the moist brisket at Black’s in Lockhart, Texas and that’s saying a lot since I consider that brisket to be one of the greatest things I’ve ever eaten. 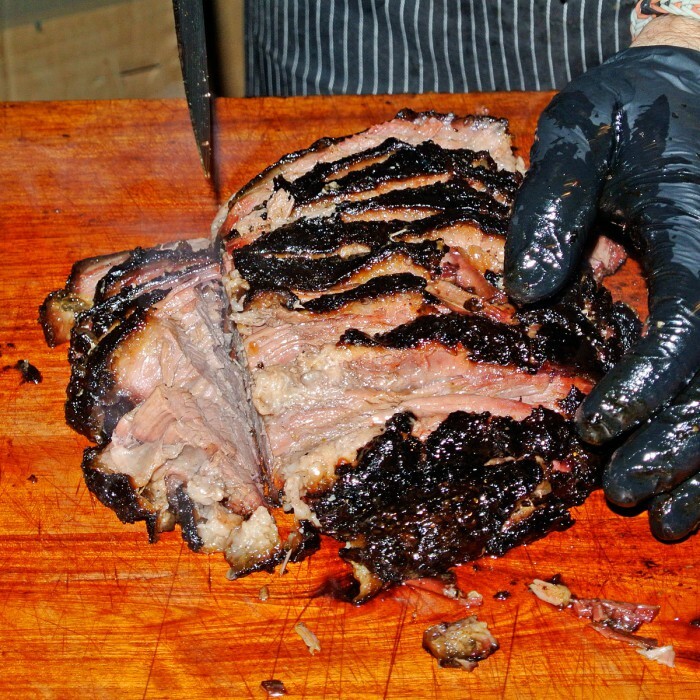 The texture is perfectly tender, shreds easily, and has the distinctive melty fattiness I look for in a good brisket. It also has enough seasoning and smokey flavor in the crispy bark to cut through the nearly dripping fatty beef that I find Delaney’s to be lacking. Outstanding. Incredible. Hugh Mangum, you’ve done it. I tip my hat to you sir. I then make my way over to our host, Robert Irvine’s table. 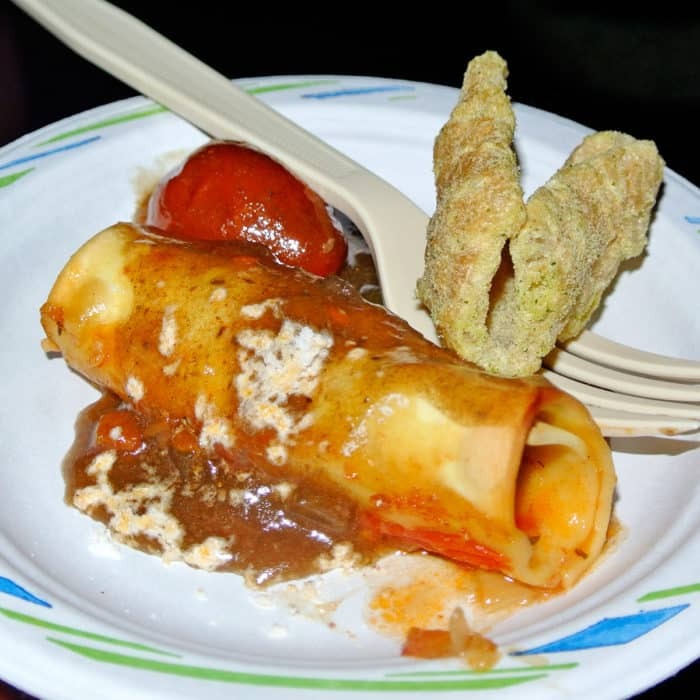 In a very Robert Irvine fashion, he’s serving BBQ Cannelloni and Chicharrones. I don’t know who would think to serve cannelloni at a barbecue event, but it just makes sense when I think about Robert Irvine. Unfortunately, this also happens to be my least favorite dish from the day. I honestly couldn’t eat more than one bite of it. The cannelloni is filled with BBQ brisket, braised beef cheek, charred oxtail, and ricotta, but I just couldn’t get past the noodley texture when combined with barbecued meats. When I first spotted the plate I was hoping that it was a fried taquito, something to add some textural contrast, but no. Noodle. The sweet tomato chutney with BBQ powder didn’t help either. This dish just flat out didn’t work for me. All I could think was “Robert, where are the CHACHOS? 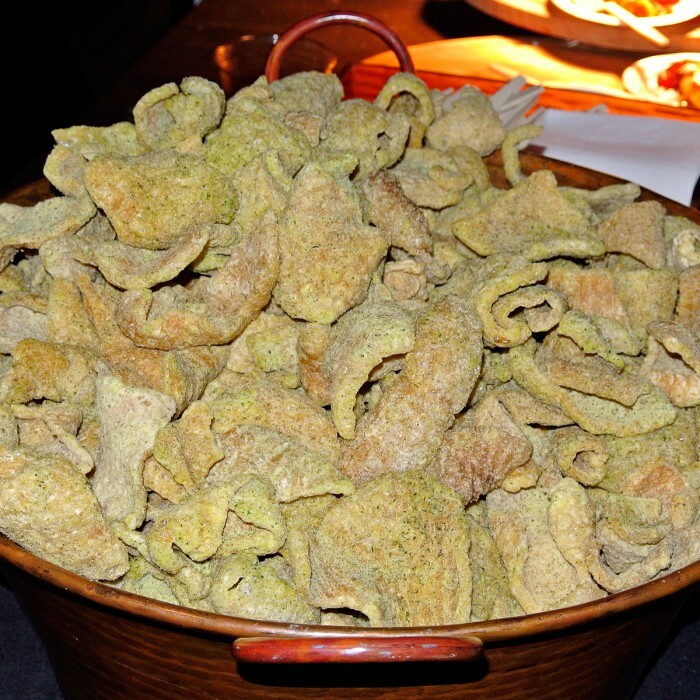 ?” I did however love his chicharones, I could eat those all day. Before I completely run out of eating steam, I stop by the Fletcher’s table for a Brooklyn Dip sandwich. I think the meat is alright. It’s a simple tri-tip that’s not as tender as I’d like that’s also started to get cold now that time has passed in the event. I’ve got a feeling that Fletcher’s BBQ is better than what I’ve just experienced. I squeeze in one more plate before I’m completely spent at the Rogue & Canon table where they are serving a dish called Duck, Duck, Pig. I definitely like the sound of it. It’s described as smoked duck sausage, pork rinds, duck egg gribiche and beef BBQ sauce on a potato roll with potato salad. It’s fine, but after already eating so many plates of awesome food, it doesn’t draw much of my attention. 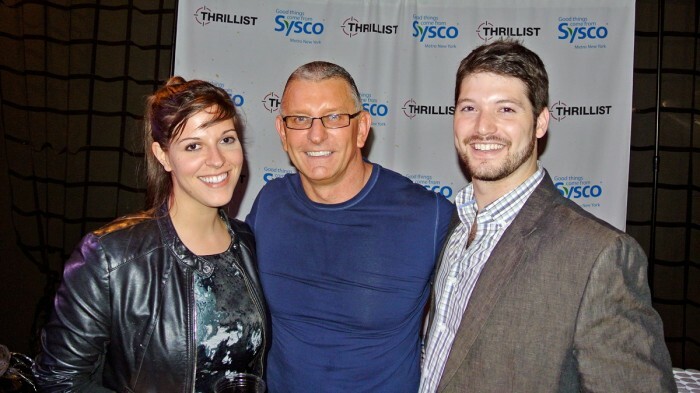 It’s at this point, Robert Irvine gets on stage to speak to the crowd. After giving his speech and thanking all of the appropriate parties, he is told that he has a mission to complete. 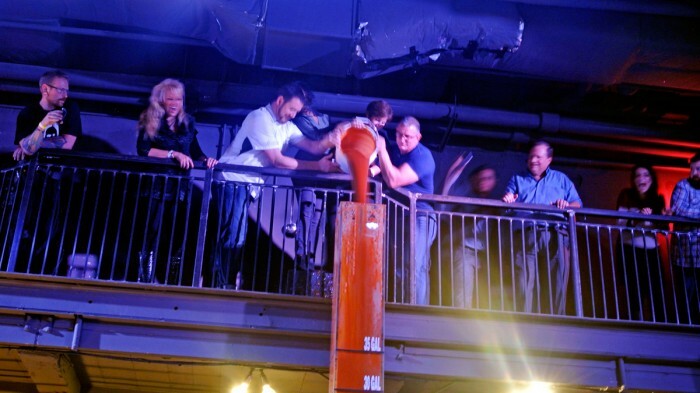 There’s a 30 gallon container on stage that he must fill with an improvised barbecue sauce for everyone in the audience to take home. At this point Robert grabs a number of volunteers from the audience to run around the venue grabbing as many things as possible that would work in a barbecue sauce. Of course all three alcohol sponsors Sam Adam, Gnarly Head, and Larceny make it in to the mix. Robert and his volunteers pour the enormous buckets of ingredients, inevitably making quite a mess when they miss the tube. Where’s my wheelbarrow? Please roll me home. 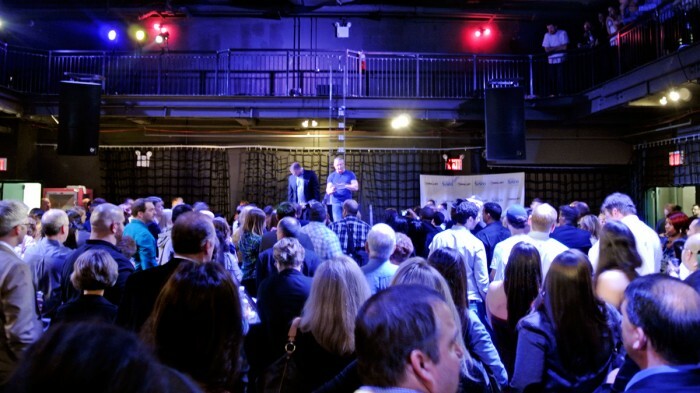 Click on to read on about the Oktoberfest event at NYCWFF 2013 featuring Andrew Zimmern and his signature sausages.